"It is a great privilege and honor, on behalf of the United States, to return to the people of Iraq a collection of cultural treasures that reflects their nation's rich history and heritage ... These are precisely the types of treasures that ICE's Cultural Property Art and Antiquities unit was established to identify, investigate and return to their rightful owners. We will continue to be vigilant about finding and prosecuting those who would rob a nation for personal gain." CNN provides a little more detail ("U.S. returns 'cultural treasures' to Iraq", CNN February 25, 2010). "Neo-Assyrian gold earrings, circa 8th-7th century B.C., from a hoard of gold jewelry known as the Treasures of Nimrud. They were discovered in 1988 in a cache under the floor of the Royal Palace of King Ashur-Nasir-Pal II at Nimrud, taken from the excavation site and eventually smuggled out of the country. ICE seized them from Christie's auction house in New York, which had been offering the earrings in an ancient jewelry sale on December 9. The estimated sale price was $45,000 to $65,000. No charges have been filed against the seller or the auction house, an ICE spokeswoman said." "A Babylonian clay foundation cone, circa 2100 B.C., that would have been embedded in a temple's foundation. The Sumerian inscription commemorates the rebuilding of Eninnu, the temple of Girsu's city god, Ningirsu. It was intercepted coming into Chicago, Illinois." "A Sumerian bronze foundation cone and a stone tablet with inscriptions on both, circa 2500 B.C. to 1800 B.C. A dealer in London shipped the items to a Connecticut-based collector, and they were imported via Federal Express to the Newark, New Jersey, international airport. The items were declared as coming from Syria, but scholars determined they were of Iraqi origin." "neo-Assyrian gold ear rings from the 8th century BC that were stolen from the Baghdad Museum and were about to be auctioned by Christie's in New York, and a Babylonian clay foundation cone with an inscription from 2100 BC, intercepted at a Chicago airport." These earrings were due to appear in Christie's December 2008 sale as lot 215 (see earlier comments). I note that Christie's was involved in a number of seizures last year, including a Corinthian krater, and an Apulian situla and an Attic pelike (see earlier comments). This was part of a wider picture of antiquities seized at New York City galleries. This return again raises the issue of rigour in the "due diligence" procedures undertaken by a major New York auction house. 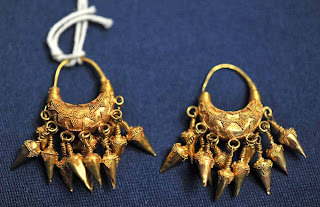 The neo-Assyrian gold earrings seized from Christies present an interesting case. The story as you report it is that they were either "discovered in 1988 under the floor of the Royal Palace of King Ashur-Nasir-Pal II at Nimrud (Iraq) and later stolen from the Baghdad Museum" or "were discovered in 1988 in a cache under the floor of the Royal Palace of King Ashur-Nasir-Pal II at Nimrud, taken from the excavation site and eventually smuggled out of the country". That sounds to me like two different scenarios. The gold objects from the Nimrud tombs were not part of the thefts from the Iraq Museum shortly after the invasion in 2003. Along with many of the treasures of the museum, they had been stored in a vault of the Central Bank in Baghdad for many years. These vaults were opened and their contents removed under the auspices of Museum officials in early June 2003. They were thereupon displayed for the benefit of CPA chief Paul Bremer and the press. These events were documented photographically by Noreen Feeney and the photographs remain online at "Secrets of Nimrud" (http://www.baghdadmuseum.org/secret_s/pages/000.htm). I suppose this means that if the earrings seized from Christies are from these tombs, that they were stolen before they made it to the Museum (or at least before the rest of the collection was sequestered at the bank), or after they had been returned to the Museum in June 2003. It it worth noting that even the ICE press release on the objects is contributing to the murkiness of their histories. I imagine it is possible that the Iraqi petition to remove these objects from the Christies sale late in 2008 had good documentation, but I have not seen the petition.